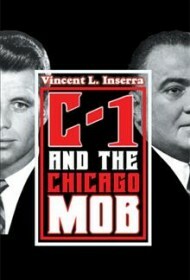 Author Vincent L. Inserra headed the FBI’s C-1 Organized Crime Squad in Chicago for 13 turbulent years. This book is his account of the FBI’s fight against the mob in the Windy City between 1957 and 1976. For Inserra, this is also a warm appreciation of his C-1 colleagues, whose names abound here. But his loyalty to the agency can cloud his judgment. For example, he never mentions the bitter antagonism between FBI director J. Edgar Hoover and U.S. Attorney General Bobby Kennedy (“Hoover would gladly oblige” Bobby’s agenda, he writes), or Hoover’s decades-long reluctance to go after the mob at all. On the other hand, Inserra provides police report-style glimpses of Giancana at leisure with singer Phyllis McGuire, the bugs in the wall at the Armory Lounge, the bags of cash dispensed to crooked cops in the graft-ridden First Ward, Sammy Davis and Dino onstage at the Villa Venice, and the exploits—game-fixing to shakedowns to murder–of bent-nosed characters such as Tony Accardo, Murray “The Camel” Humphreys and “Milwaukee Phil” Alderisio. This can make for eye-opening reading, but a good editor or co-writer could sharpen and dramatize the material to better effect. Also available in hardcover and ebook. Use any or all filters and click "GO".